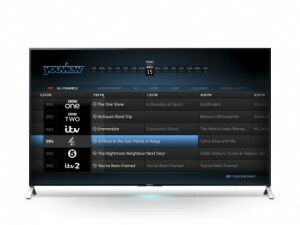 Sony has announced that it will integrate connected TV service YouView into its range of 2015 Bravia TVs, making it the first manufacturer in the UK to do so. The electronics giant said it will start to sell the new sets from this summer, allowing viewers to access the YouView interface, backwards EPG and content from the BBC iPlayer, 4oD, ITV Player and Demand 5 catch-up services without needing a separate set-top box. “We are thrilled to announce a major collaboration with Sony on our first ever project to make YouView available on TVs,” said YouView CEO Richard Halton. Sony said its new line-up of TVs will include 12 Ultra HD models and that YouView will be combined with Android TV and Sony’s One-Flick Entertainment service. The news comes after California-based TV maker Seiki announced at the Consumer Electronics show in Las Vegas last month that it will be the first to introduce HD sets featuring the new Freeview Connect TV service in the UK by the third quarter of this year.